That’s the adage Wanda Kenton Smith cites when convincing clients of her advertising and public relations agency that women are as important as men when making a boat sale. 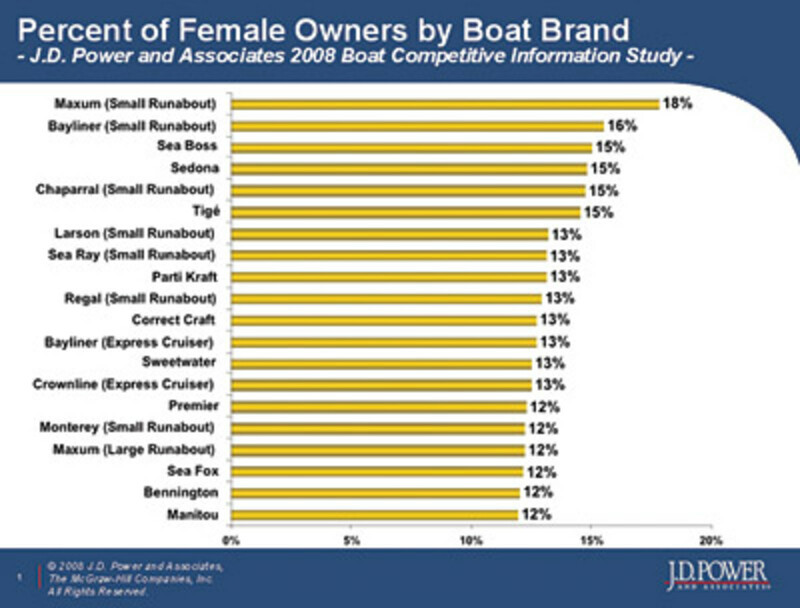 While data shows most boats are registered to men, some companies are increasingly trying to include women in their marketing strategies. Because 86 percent of boaters are married, according to J.D. Power and Associates, the decision to buy might lay in more than just the registrant’s hands. Some say the industry would do better if it more aggressively reached out to this demographic. “While our industry demo is heavily male-dominated due to boat registration in his name, don’t be deceived into thinking that there isn’t a twosome involved,” Kenton Smith says. Kenton Smith, who founded International Women in Boating and has held seminars designed to teach dealers how to market to women, says companies are beginning to recognize the value of marketing to females. The industry has come a long way, but much more work is needed, Kenton Smith says. “Many are marketing the same way they did 15 years ago,” she says. In 2002, when J.D. Power first began recording data in the marine industry, 8.5 percent of all registrants were women, according to Todd Markusic, J.D. Power’s director of marine practice. In 2008, that number has risen .2 percent, to 8.7 percent. The 2008 J.D. Power survey stemmed from boats purchased between June 1, 2006 and May 31, 2007. Of those female registrants, 12 percent are single, while 5 percent of all men are single, Markusic says. “Obviously it’s largely the single women who are buying boats that we’re capturing, but that doesn’t mean that women aren’t involved in boating, it just means that the boat might not be specifically registered in her name,” Markusic says. Hagadone Marine’s Yacht Club Sales and Service in Coeur d’Alene, Idaho, has known the power of the female buyer for years, according to parts manager Dugan Bailey. Once a year, the dealership invites the wives of all its customers and female boat owners to attend “Women Making Waves,” the name originally given to Genmar’s program designed to educate more women and get them hooked on boating. Hagadone adopted the concept of “Women Making Waves” and made it its own event. The women come for massages, cocktails and lunch before they get lessons in driving and docking. Most importantly, no husbands are allowed. This year’s April event was a success, according to Bailey. And they also learn to drive boats. The two-day training course consists of four sessions. The women get divided into groups, depending on what they own or what boats they want to try. One attendee realized how easy it was to operate the boat, and she had more fun on it without her husband, Bailey said. As a result, she bought her own Cobalt. “Now they have a ‘his’ boat and a ‘her’ boat,” Bailey says. Though the program is no longer overseen on a corporate level at Genmar, some of its brands have maintained it and say it’s thriving. Four Winns, a Genmar company, still uses the program, according to Cathy Lazar Nelson of LindyLazar Marketing Communications, the company that markets Four Winns. “When Genmar came up with the program we were so excited, and when it was floundering due to lack of resources, we tried to pick up on it and continue in that vein, because it’s so critical,” Nelson says. 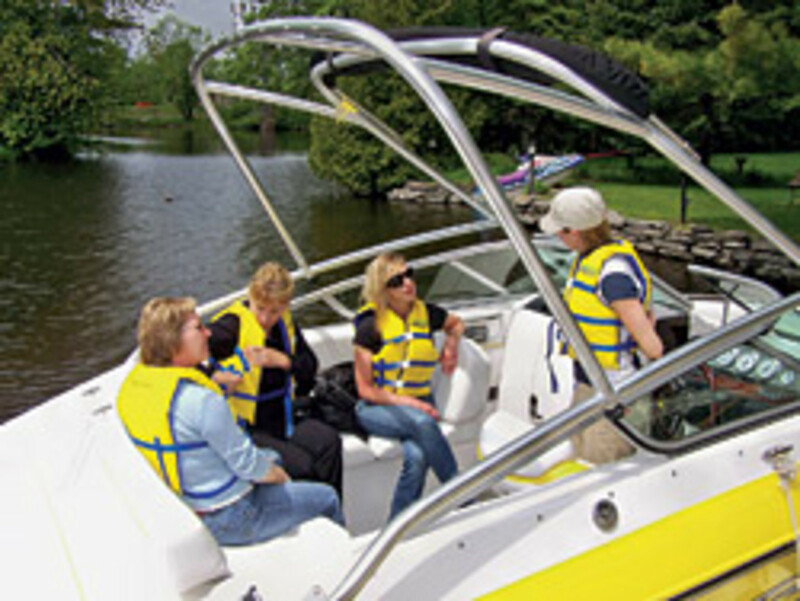 Women also can be valuable assets in convincing families that boating is a worthwhile investment. Marcia Kull, who launched the “Women Making Waves” program when she worked as vice president of operations at Genmar, says the program was designed so different brands and even dealerships could make it their own without help from corporate. According to Kull, an attorney, 90 percent of all purchasing decisions can be “nixed” by a woman. Marine Marketers of America (MMA) is launching a pilot program this summer with a handful of dealerships throughout the country targeting women boaters in a safe boating course. The association is hopeful the program will create an umbrella that will brand such courses and eventually achieve a national presence, Kenton Smith says. Jim Rhodes of Rhodes Communications sits on the MMA board. The MMA wanted to create a free program to pool marketing resources and provide a service to the industry, Rhodes said. Because it would be free, it had to be a “bite-sized” program the MMA could launch and turn over to the industry to develop into a for-profit sector. More to the point, Rhodes says women can be turned off to learning about boating from a man — traditionally a father, a husband or a big brother. “Men have a style of direction that often has a lot of yelling ... and women don’t feel empowered,” Rhodes says. Kull, in her market research at Genmar, says women did not mind male instructors as long as they did not yell and as long as the classes were not co-ed. Classes taught by women could be a tool dealers can use to attract female buyers, Rhodes said. “That’s going to convert into sales; especially in a flat market, education is a key tool for boosting sales,” Rhodes said. The MMA’s tool kit would include brand logos, a branding identity, graphics, templates for a brochure, a local ad, a local mailer and a local press release. The logos and materials are still in development. “They could use this to promote it under this overall branding umbrella,” Rhodes says. The pilot will include about six dealerships, several of which carry the Regal Marine line. May, who is working with MMA in the endeavor, offered a few Regal dealers to participate in the program. Among them was Boat Tree in Orlando, Fla.
Boat Tree holds successful biannual classes that are open to any woman, boat owner or not, according to marketing manager Jennifer Martin. Husbands are allowed to attend classroom training, but after that, they have to retire to the onsite marina restaurant or bar while the ladies learn hands-on boating, Martin says. The class has helped women feel comfortable enough to trade up for a bigger vessel, and it gets them excited about boating. “We think that the women make the final decision,” Martin says. 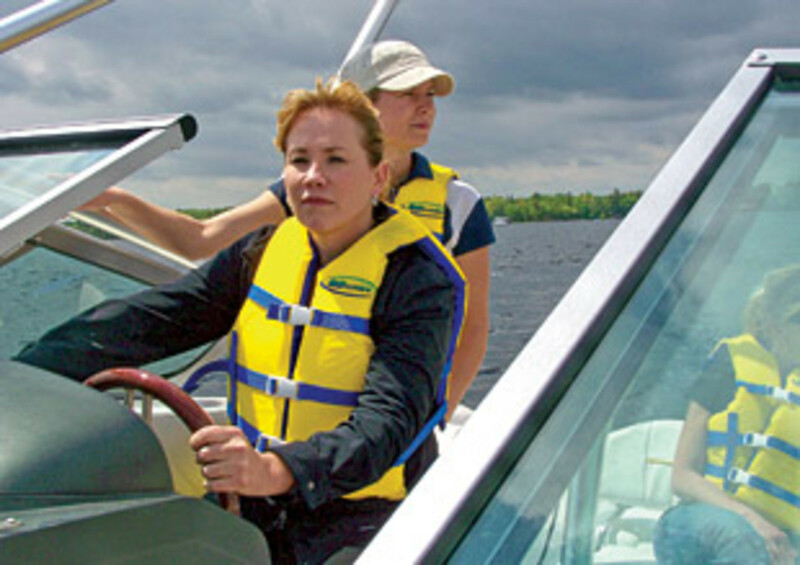 Carly Poole has written a curriculum for women’s courses at Buckeye Marine in Ontario, Canada. She has been consulting with the MMA to help with the pilot. In her program, “Women Behind the Wheel on the Water,” all the instructors are women. “We learn differently, and as females we understand that learning cycle,” Poole says. At Buckeye Marine, there is a classroom portion as well as hands-on learning, and the course costs $150. Because instructors volunteer their time, proceeds go to a local charity. Customers then get a tax receipt for about half the cost. Poole, a lifelong boater, launched the class in 2005 to help eliminate the stigma attached to women boaters. Participating at the helm, docking and trailering are empowering for women. “There’s a certain feeling of pride when you can jump out of your truck in your high heels and drive a boat back off a ramp,” Poole says. And empowerment helps women get excited about boating as a lifestyle, she adds. At Volvo Penta, there has been tremendous feedback with women and joystick maneuvering, Kull said. Surveys showed that respondents, largely the male registrants, gushed about how they loved their boats because their wives were also comfortable operating them. That translated to more time spent on board, which Kull says equates to a longer and more passionate boating lifespan. There are general assumptions about what women want on boats, including color, upholstery, head facilities, storage and comfort. Though some women care about those things, dealerships err when they assume that’s all that matters to women. “Throw those false perceptions out the window, and give her the professional courtesy to ask about her areas of interest,” says Kenton Smith. One feature, though, tops a woman’s list of wants — safety for the whole family. One of Hagadone’s customers experienced the worst-case scenarios when the driver slipped off his 50-foot Sea Ray on a cold day. Kenton Smith says the sales professional will seek to offer training for the family, the couple or the woman to help alleviate her fears. Salespeople who don’t realize the influence of a woman in the buying process, or her ability to purchase alone, are missing a great opportunity, Kenton Smith says.